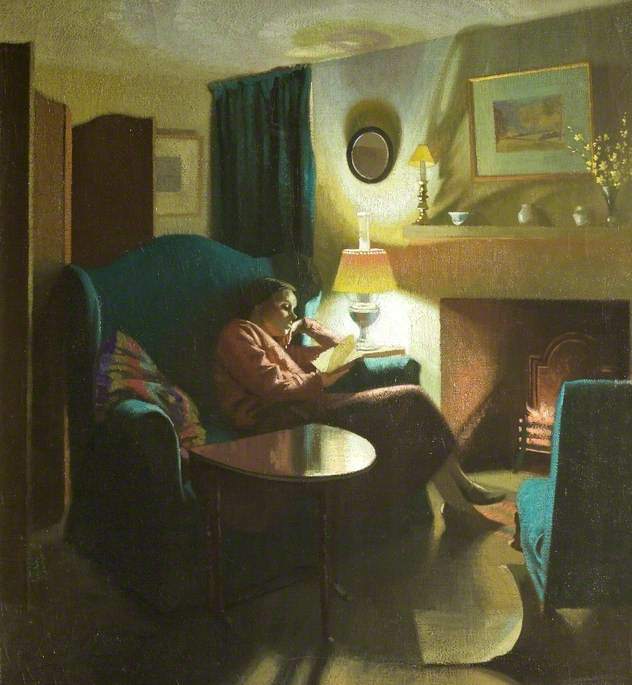 Gardiner, Gerald; The Artist’s Wife Reading; Cheltenham Art Gallery. c1935. At present on temporary public display in the ‘Friends Gallery’ of Cheltenham Art Gallery & Museum (The Wilson) is this painting by a student of the painter of the previous blog, William Rothenstein, at the Royal College of Art in the 1920’s. The work was painted around 1935 when Gerald Gardiner and his wife were living at Bisley – a village close by to Oakridge and Far Oakridge where Rothenstein lived. On leaving the Royal College of Art in 1927 he taught at Cheltenham School of Art until he died in 1959. At Cheltenham he lectured not only in painting but was also concerned with print-making which was a particular strength of the Art School, prominent in the rise of the important early twentieth century print revival and the new techniques introduced after WW2. Gerald Gardiner and his wife lived in an old stone cottage on one of the steep winding, hilly, roads of Bisley. Some years after the Gardiners time I and my family also lived in Bisley – not far from the Gardiners’ house. The artist has captured the spirit of life in such surroundings – the difference between the Gardiners and ourselves was that when the Gardiners lived in the village it appears that there was no mains electricity and therefor oil-lamps were in use. Like Rothenstein’s ‘Mother and Child’ this painting calmly and simply catches the calm mood of domesticity and comfort – although the screens around the door suggests cold drafts, something with which we too were familiar in the windy village some decades later! Like my comments on Rothenstein’s painting, this work requires the viewer to set aside pre-conceptions and let it speak in its own, non-verbal, language.